Ever since Rob Thomas launched his successful Kickstarter campaign to fund a Veronica Mars reunion movie several weeks back, sci fi fans have been buzzing about which genre shows will get a new life by this means as well (and you can read more about that by browsing through my previous Kickstarter Fallout posts). But then we all seem to have ignored the next logical progression: a completely new series funded this way. 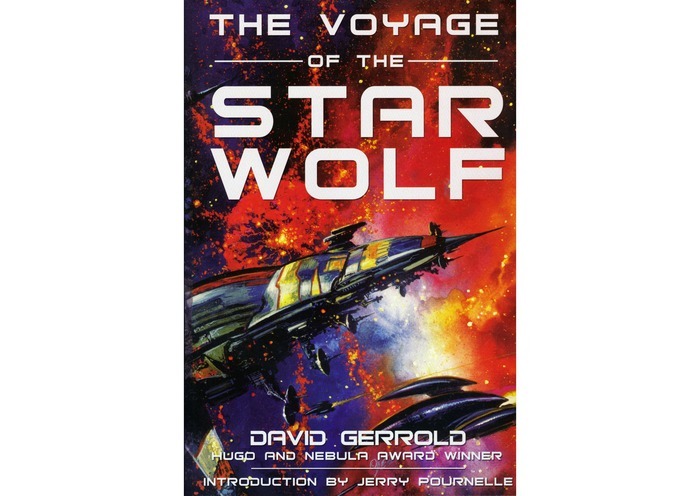 But Star Trek veteran David Gerrold did not and he has started up a campaign to fund an ongoing series based on his Star Wolf novels. For those of you who do not recognize Gerrold’s name (and shame on you if you don’t) he was a writer on the original series and penned one of the all-time favorite Trek episodes “Trouble with Tribbles”. He also wrote the episode “The Cloud Minders” as well as two installments from the animated series (“Bem” and “More Tribbles, More Troubles”). He would then go on to create the Land of the Lost Saturday morning series in the 70’s and would contribute scripts to several other genre shows over the years including Tales from the Darkside, the 80’s Twilight Zone revival, and Babylon 5 (one of the better first season episodes “Believers”). He would also revisit his beloved tribbles once again on Star Trek: DS9 in the retro-episode “Trials and Tribble-ations”. He has also been a celebrated science fiction author writing over fifty books and received the Hugo and the Nebula for The Martian Child. Jon Thomas Korie is supposed to be the Captain of the LS-1187, a starship so new it hasn’t earned a name yet. But two days before launch, he’s bumped back down to Executive Officer, and Captain Lowell takes command for what is supposed to be his last mission. But Captain Lowell makes a strategic error that brings an entire Morthan warfleet down on the Silk Road convoy, a disaster for the Allied Worlds. The LS-1187 is badly damaged in the fight, it’s left dead in the water, with half her crew dead or injured. Captain Lowell is dead as well. With almost no resources at all, Jon Korie has to rebuild his ship and bring his crew home safely, even while the enemy is searching for this last surviving starship…. This is a story of the courage of ordinary people in extraordinary circumstances. It’s about the strength of human beings in an impossible situation. It’s about war and revenge, hope and triumph. It’s about us. The Star Wolf is an epic adventure of ordinary men and women caught in an extraordinary war against a race of superhuman creatures… the Morthans who have augmented their evolution, genetically transformed themselves into a breed of gigantic warriors, trained for aggression, ferocity, and hatred… and they have sworn to destroy humanity! Gerrold has recruited fellow Star Trek/Babylon 5 veteran D.C. Fontana and producer David C. Fein for this endeavor and they claim that they can produce the pilot for the series for about $650k and subsequent episodes in the $500k range (not certain if those are 30 minute or hour long installments, though). Their initial goal is that $650k mark to produce the pilot and any additional money raised would go to producing more episodes. And they claim that the first story arc could be covered with four eps (and those scripts have been written by Gerrold). Personally, I consider this some pretty exciting stuff. This gives a science fiction series a chance to break free of the tyranny of the Nielsens and networks and and prove that that dated system no longer has to be the model for producing episodic sci fi. In this case, the series will live and die by the fans. As long as we support it, then it will stay in production. I do question, though, whether this system of crowd-funding could support a show like this over the long run. But it could definitely get it launched and then maybe additional “seasons” could be funded by advanced subscriptions or something along those lines (something like $2 per episode for six installments would be in the realm of possibility to support the budgets they are talking about). The pledge amounts range from $10 to $10,000 and the higher levels give you the chance to appear in an episode in a bit part and die on screen. Surprisingly, this has not yet received much attention from the sci fi community. I stumbled across it posted on the Sci Fi sub-Reddit and then passed it along over at the Star Trek sub-Reddit, but it didn’t get much love at either of those places. People there preferred to upvote posts like “What’s a good sci fi name for my dog?” or “My neighbor dressed up their baby as a Klingon” or the latest iteration of “What sci fi show should I watch these days?”, so gleen what you will from those social networking sites. But then the bigger sci fi sites like io9.com and Blastr.com have been slow to pick up this story as well (the latter finally acknowledged it at this link), which is a big fail for the sci fi community in my opinion. This could be the next major science fiction franchise, potentially rivaling Star Trek one day. And we have the chance to shepherd it into existence and keep it going without any networks cancelling it based on short-sighted decisions. This is nothing less than a call to arms for sci fi fans. If Rob Thomas could raise over $2 million for a Veronica Mars movie in less than two days, we can easily help Star Wolf get to its minimum of $650k by the June 2nd deadline. This is our chance to claim sci fi back from the broadcast and cable networks and make a decent show without their interference. Let’s not let it slip by. Go on over to the campaign site and pledge at least $10 and LET’S MAKE THIS HAPPEN!! !